For the last few months, I've been interested in community-building for writers. So I was delighted when Sarah Stevenson, author of The Latte Rebellion and a long-time blogger at Finding Wonderland, tagged me to be part of the Next Big Thing Author Meme. Not only is this meme about writing and a promotional opportunity for authors, it gives me another chance to reconnect with the blogger community I was part of years back as well as connect with writers I'm acquainted with now. For readers, this meme provides you with information on books that are in the pipeline toward publication or, even, in the most early stages of work. 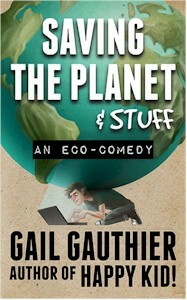 I'm going to be talking about Saving the Planet & Stuff, which will be republished at the end of this month as an e-book. Then I'll be linking to three more authors who will carry on with this project. Well, back in 2001, when my editor, Kathy Dawson, and I were first discussing the book, I was thinking of calling it Summer Work. According to an e-mail I found, I thought that was sort of deep because the main character (named Edmund at that point) had a summer job, but just what was the real work he was doing that summer? Kathy's response was, "Let's sit tight on the title for now." And it ended up being called Saving the Planet & Stuff, a title I'm very happy with, when it was published in 2003. My family dropped in on my in-laws and found that they had company, an older couple on their way to their cabin in Maine. The husband told my preteen son that he ought to come to their cabin with them and help him set up his laptop. That definitely didn't happen, but the idea of a young person being thrown in with older people he barely knew intrigued me, and I thought about it for a couple of years. This is mainstream fiction for older YAs and adults. I say that not because the content is so incredibly mature, but because much of the humor involves the office/workplace and environmentalism. The work world is something teenagers are beginning to take an interest in. Middle grade and younger kids? Not so much. Committed environmentalists have made a lifestyle choice that sometimes puts them at odds with the rest of the world, and that conflict is the basis for much of the humor in Saving the Planet & Stuff. Teenagers are beginning to understand that life is going to involve some decision making. I'm embarrassed to say that this is something I have fantasized about. I can't say I've thought about it for my other books, but definitely for this one. The young main character, Michael Racine, is the hardest part to cast because young actors age out fast. Frankie Muniz is way too old, though he would have been good in his youthful heyday. Charlie McDermott of The Middle still plays a teenager. You need somebody who can project an attitude and who can be amazed that there are people in the world who are not of his world. The two pivotal adults are much easier. Blythe Danner with a long braid for Nora Blake and, if he would let his hair go gray and grow a ponytail, Tom Selleck for Walt Marcello. Big. Imposing. Sly wit. I wouldn't even object to the 'stache so long as it was gray. A twenty-first century mall child and two aging environmentalists experience culture clash when they're thrown together for the summer. This question is phrased oddly. I am going to answer it in this way: I am self-publishing an e-book edition in order to keep Saving the Planet available as a back list title. It was originally published by G. P. Putnam's Sons in 2003. I don't know if I could work that out even if I went through all the old e-mails. I can tell you it takes me a long time to write a book--months, if I'm lucky. Then there are many revisions. I know my editor and I were e-mailing about the book in 2001, which means she must have had a manuscript to look at at that point. Then it was published in 2003. This is always a difficult question for me because I write a lot of humor within mainstream fiction, and I don't always see much of that to compare myself with. I'm going to throw out the title I Am a Genius of Unspeakable Evil and I Want to Be Your Class President. Though that is a school-based story, whereas Saving the Planet is workplace and environmental humor, I found the humor in I Am a Genius mature in the same way that I think the humor in Saving the Planet is mature. My older son liked YA fiction when he was a teenager, and I was his book shopper. I understood his humor and was able to bring things back from the library that he actually liked. One day he said to me, "All the books you bring me are about girls." I realized he was right. At that time, funny books tended to be about girls. Books about boys were about sports or something violent or dark, which he had no interest in whatsoever. So I set out to write a funny book about a teenage boy for my teenage boy. Who Else Has A Next Big Thing To Blog About? Sarah Albee, who has written a number of children's books (and is the only writer I know, personally, who has published under more than one name), will be continuing with The Next Big Thing at her blog. While you're waiting to hear about what's coming up in her writing world, check out her blog post about hunting for bathrooms at the Mark Twain House. Crissa-Jean Chappell, the author of Total Constant Order as well as Narc and a contributor to Dear Bully, will be writing about her Next Big Thing at her journal. And I believe we'll be hearing about Dawn Metcalf's Next Big Thing, as well. Dawn's first book, Luminous, was published in 2011, and her next book, Indelible, comes out this summer. Watch their blogs for their Next Big Thing. Later this month, I hope to do a Next Big Thing roundup of NBT posts from other writers.